Lot of people believe that Ras Mohamed does not belong to this world with its extraordinary environment and unique location. The air here is cleaner and even smells different than any other place of Egypt. Located near the Egyptian Israeli borders, Taba has always had a special unique character. Located near the borders of Israel, Jordan, & Saudi Arabia, Taba was the last city to return to Egyptian authorities 1989, after Israeli occupation of Sinai. Located at the foot of Moses Mountain in the Sinai Peninsula. Its relative proximity to Sinai resorts has resulted in a growing number of visitors. The area unique natural & cultural values was a primary goal in the declaration of the St. Catherine National Park. The South Sinai is one of the most spectacularly beautiful landscapes on the planet, some of which has in recent years been set aside as national parks. No visit to Sinai is complete without uncovering (Ras Mohamed, Colored Canyon, St. Catherine, Abu Galum & Nabq). Sharm El Sheikh is one of the most popular resorts in Egypt and lately all over the world. The city is the largest in Sinai and surely an important touristic destination that welcomes many tourists who visit Egypt. Dahab is the most wonderful cities located in the Sinai Peninsula in Egypt. Situated over the shores of the Aqaba Gulf, Dahab is famous for its wonderful beaches and magnificent spots for diving and snorkeling. The Western Wall, Wailing Wall or Kotel is located in the Old City of Jerusalem at the foot of the western side of the Temple Mount. The wall was built by around 516 BC and renovated later by Herod the Great around 20 BC. Prayers are held here since 132 CE and are one of the most sacred places for the Jews. 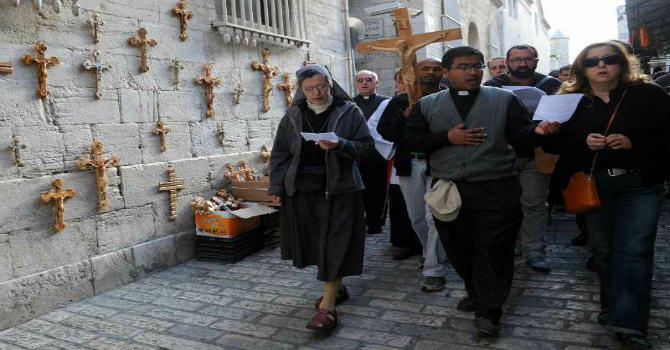 The Via Dolorosa (Way of Suffering) is a historical street divided into two parts located in Jerusalem. The Via Dolorosa in the Old City of Jerusalem is the road Jesus walked from the place of Pontius Pilate’s sentencing to Golgotha. It is also the street where Jesus Christ passed through at the time of His crucifixion. The Arava Valley is dry desert, characterized by yellow & red mountains. It covers the desert areas of southern Israel to the north of Eilat and can be explored from the Arava Highway. The Arava Valley was once a regular site for Lappet-faced Vulture but this is now an extremely rare bird in Israel and future records seem unlikely. Jerusalem is a holy city to three religions; Jerusalem is one of the oldest cities in the world. The City of Gold, as it has come to be known in Hebrew, is a fascinatingly unique place where the first century rubs shoulders with the twenty-first century, each jostling for legitimacy and space, and where picturesque "old" neighborhoods nestle against glistening office towers and high-rise apartments. Why book Egypt and Jordan Combined Travel Package?. Travelers from all over the globe are advised to explore more than one destination during their trips. You are already paying for the airlines’ tickets, so why not visit two countries located near each other’s?.